For this project, I wanted to focus on the impact religious revival movements and speakers would have had on the much larger American Revolution. To understand this connection, and in fact to see with there was any connection at all, I started by pouring over newspaper articles printed at the time of the Revolution. The basic search used two key words: religion and revival. The newspaper articles provided unique insight into the ways Americans were actively thinking and writing about their religious environment. Much of the rhetoric from these articles centered around warnings of false teachings, urgent admonitions for the American public to pursue virtuous lifestyles, and the fiery enthusiasm of conversions and revivals. There was a very real sense of urgency in the tone of their authors, begging the reader to take special care in heeding their words because something big was on the horizon. This sense of urgency found in the newspaper articles makes perfect logical sense, especially from the eyes of a religious authority figure. The new United States was in the midst of a massive, chaotic upheaval. The constant struggle of a brutal war had an exhausting effect on everyone. But not only were they in the middle of a Revolutionary War, these colonies knew they would eventually face the task of constructing a brand new nation of their own. The immense responsibility of trying to craft a new kind of political state cannot be underestimated. In times like these, everyone is searching for answers. For the religiously-minded individuals (of whom there were many), religious-based answers were the answers they felt could do the most positive good. Every heresy outlawed and every revival convert were necessary for the public virtue, helped win the war, and made sense of some of the chaos. Not every one could be a soldier or a politician, but everyone could be involved in the effort at this religious level. 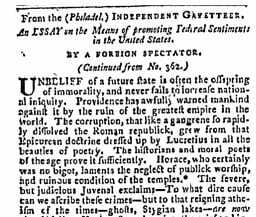 One such article credited to a “foreign spectator” writing for the Independent Gazetteer wrote poignantly about his views on the importance of religious adherence. He wrote that “UNBELIEF of a future state is often the offspring of immorality, and never fails to increase national iniquity. Providence has awfully warned making against it by the ruin of the greatest empire in the world.” Obviously, this author saw that the future of the nation rode on the religious devotion of the people. He went to say that the “political corruption of the British empire… proceeds in a great measure from irreligion,” clearly separating the colonists from their British counterparts. Not all the newspaper articles were quite as serious as the one written by the “foreign spectator.” Another author from the Newport Herald recounted a much livelier tale concerning a young Scotch Presbyterian, who, “having heated his brain by reading the book of Martyrs, the cruelty of the Spanish inquisition, and the history of all the persecutions which ever were raised by the Roman Catholics against the Protestants,” decided to it was his personal duty to try and share the Gospel with the Pope himself and convert him to to Presbyterianism. Amazingly, he did in fact make it to the Pope in Rome, but was politely sent back home, unsuccessful in his attempt. A story like this may seem silly or even absurd, but it further highlights the real sense of urgency being experienced by American Protestants during this tumultuous time. Reading a few short snippets excerpted from newspapers is not really the best way to understand the religious attitudes of the times. Word Clouds are a great way to visually represent this much data. By analyzing this visualization, it becomes readily apparent which words and phrases were discussed most frequently and likely had the most importance to the people writing them. The larger the word, the more times in was used. As you can see, some words stand out very prominently. The word ‘religion’ obviously dominates the text. However, it is not the only word of significant influence. Of almost equal size, the word ‘revival’ is also extremely important. Other important themes also stand out, such as the theme of humanity made by ‘men’, ‘world’, ‘people’, ‘society’, and ‘mankind’. The physical institution of the church is also present as it is represented by ‘church’, ‘united’, some denominational titles, and ‘doctrine’. Newspaper clippings alone are not enough for any serious scholar to glean a clear understanding of the religious climate of the American Revolution. Secondary research sources add a more cohesive framework to surround these scattered excerpts. Well-researched, scholarly historical accounts put these upsurges of revivalism in context with their historical predecessors. The time of the American Revolution is not actually in what are considered by scholars to be periods of “awakening” – such as “The Great Awakening,” but instead finds itself in-between the first and second awakenings. Although revivals were certainly taking place, they were not the unified, steady, movements of what would be classified as a historical period of revival. Now as you can see, this word cloud, based on secondary sources, is extremely different from the first, despite being concerned with the same subjects and time period as the newspaper clippings. 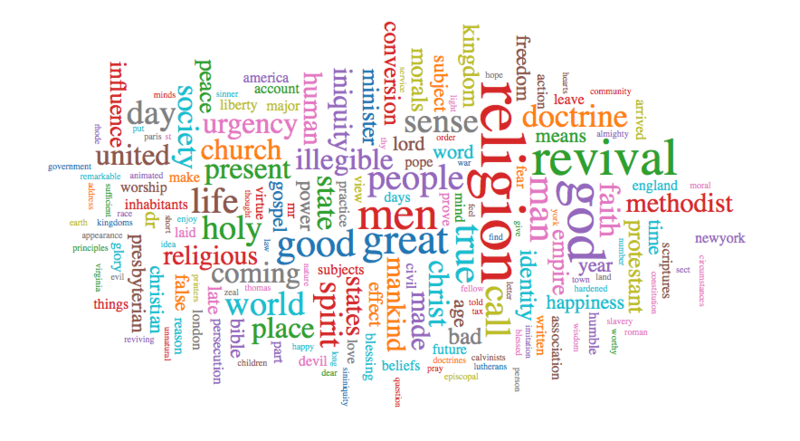 This word cloud strongly emphasizes church denominations, particularly the Methodist Church. Religion is no longer even one of the larger words. Cities and places are also very prominent in this second visualization, along with distinctions between ‘American’ and ‘British’. Issues of virtue, righteousness, and faithful doctrine have almost vanished with these historical sources. What does a comparison of this nature do for our mission to understand the religious climate of the American Revolution and the role revivalism played in that? As centuries have past, the emotional investment has naturally eroded and been replaced with historical facts. This is what always happens with history. The important thing that these individual newspaper articles do is that they give modern historians a window back into those earlier times to better understand the emotions and motivations of the people who lived in them. Chacon, Richard, Michael Scoggins. The Great Awakening and Southern Backcountry Revolutionaries. Cham: Springer, 2014. Andrews, Dee. 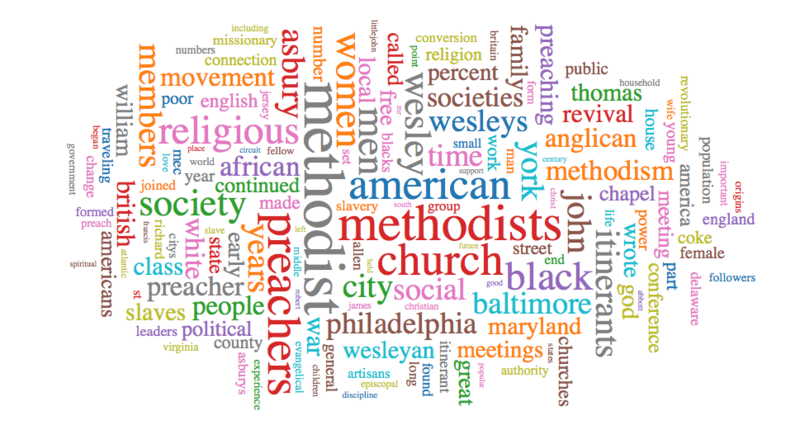 The Methodists and Revolutionary America, 1760-1800: The Shaping of an Evangelical Culture. Princeton: Princeton University Press, 2000. Den Hartog, Jonathan J. Patriotism & Piety: Federalist Politics and Religious Struggle in the New American Nation. Charlottesville: University of Virginia Press, 2015 . Devereux, Jarratt. A Brief Narrative of the Revival of Religion in Virginia in a Letter to a Friend. London: R. Hawes, 1778. Kidd, Thomas S. Baptists in America: A History. New York: Oxford University Press, 2015. Kidd, Thomas S. The Great Awakening: The Roots of Evangelical Christianity in Colonial America. New Haven: Yale University Press, 2007. Little, Thomas. The Origins of Southern Evangelicalism : Religious Revivalism in the South Carolina Lowcountry, 1670-1760. Columbia, South Carolina: University of South Carolina Press, 2013. Murray, Lain. Revival and Revivalism: The Making and Marring of American Evangelicalism 1750-1858. Edinburgh: Banner of Truth Trust, 1994. Noll, Mark, David Bebbington, George Rawlyk. “Relevant Chapter”. Evangelicalism : Comparative Studies of Popular Protestantism in North America, the British Isles, and Beyond 1700-1900. New York: Oxford University Press, 1994. Prud’homme, Joseph. Faith and Politics in America: From Jamestown to the Civil War. New York: Peter Lang, 2011.